I don’t just have a personal fascination with robots, I’ve made a career of them. My technical career started at Honeywell Systems working on night vision applications in the late 1970s and eventually I found myself amongst robots with roles at Rethink Robotics and Kiva Systems. Today, I spend my days with a bug-eyed, two-wheeled, unusual-looking yet cute robot called KIBO. We say that KIBO teaches children aged four to seven years how to program, but really – it’s much more than that. First, we have to consider the importance of science, technology, engineering and math. These are core subjects for education, but it’s vital that children learn about this by doing, being active and having fun. It’s also important that children have positive and rich experiences creating and building things at an early age. There’s not much you can control in your life at five years old – we’ve seen hundreds of children gleeful at being able to build and control KIBO. It’s well understood by researchers, such as my co-founder Marina, that at four to seven years children’s self-images and self-identities begin to take shape. Giving them the means to build, fix and problem solve, and the confidence to do so, gives a life skill. It doesn’t mean that every child who has a KIBO will grow up to become a programmer, it’s about applying a learning approach to technology and logical thinking. 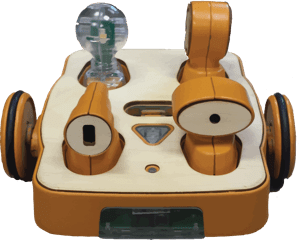 KIBO engages children with familiar wooden blocks and an approachable robot that the children can dress up, decorate and control. It’s all about open-ended play, where children’s creativity can go wherever they want. KIBO reaches kids where they are – no screens, no rules, just good old-fashioned-play meets cute robot.